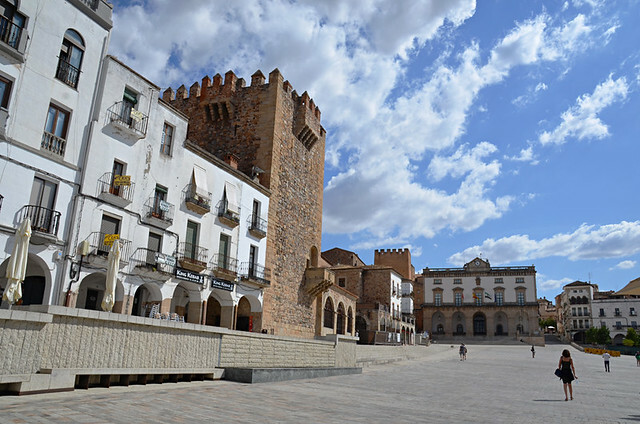 The drive from Alentejo through seemingly endless Extremadura plains to the UNESCO World Heritage Site of Cáceres wasn’t a classic one, apart from the eagles. There were loads of them. Enormous, graceful birds with hooked beaks and golden feathers swooping so low they flew almost on a level with the car. I’d never seen so many in the wild. And it is wild, there’s nothing out there for miles and miles – no hamlets, no people. Just eagles and their prey. It’s an hour and a half drive for us and we embarked on it thanks to a Guardian article about food in Alentejo. 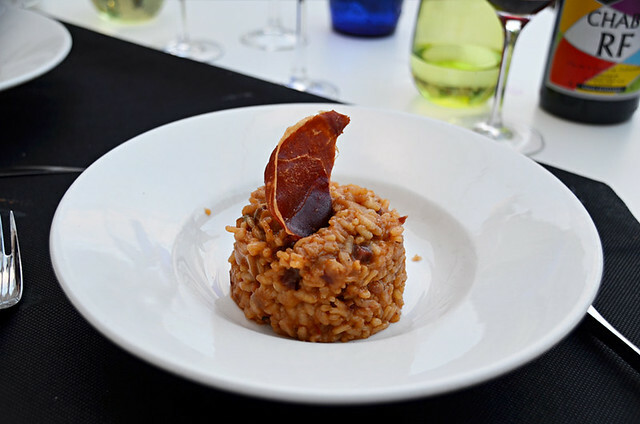 To be more precise we made the journey because of an insightful comment on the Guardian article which advised if foodies in the Alentejo were after creative cuisine, they’d be better heading to adjoining Extremadura and the likes of Cáceres. 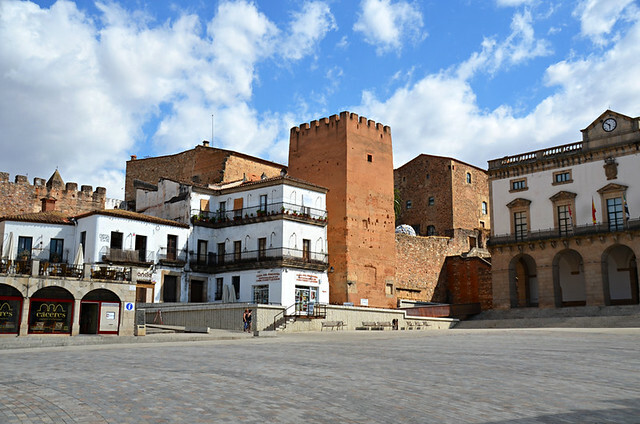 Cáceres is an ancient city known for being at the centre of what was basically a continuous tug of war which lasted centuries, thanks in part to it being located on an important trading route. The Romans had a settlement there for a period and the Moors and Christians squabbled over it regularly. Being on a trading route brought in settlers from all points of the compass. The result is a lavish casco histórico whose architecture reflects the influences of those who inhabited it through the ages – there are Roman, Gothic, Moorish and even Italian Renaissance touches in its towers, palaces, fortifications, churches, and walls. Our hotel, the NH Palacio de Oquendo, had a lot going for it. 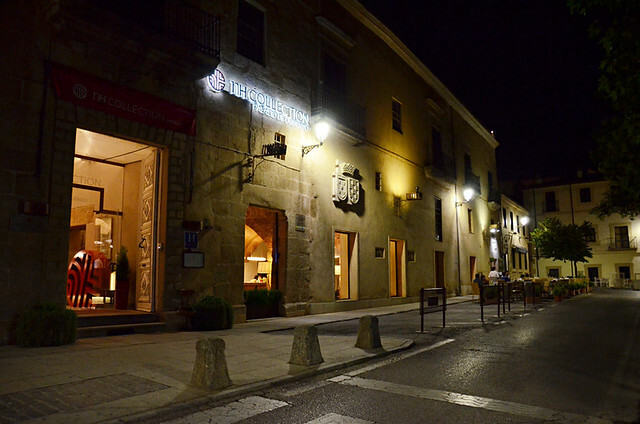 The Palacio is located in a 16th century building in the heart of the old town – a lovely prospect when drooling over the photos before booking it. Less so when negotiating a maze of narrow streets which led tantalizingly close and then whipped us away in the wrong direction. Google sat nav was to blame, being more of a hindrance than a help. The annoyingly calm woman’s voice telling us to take roundabout exits that didn’t exist. Eventually one led us to Plaza de San Juan and we parked on the little square directly outside of our hotel. It was temporary. We dumped our bags and took to the streets again to reach a nearby car park. Luckily we’d already passed it once, by mistake, so it was relatively painless to find it again. Given the nature of the old streets, it took longer to drive to the car park than it did to walk back to the hotel from it. By the time we’d parked it was lunchtime. 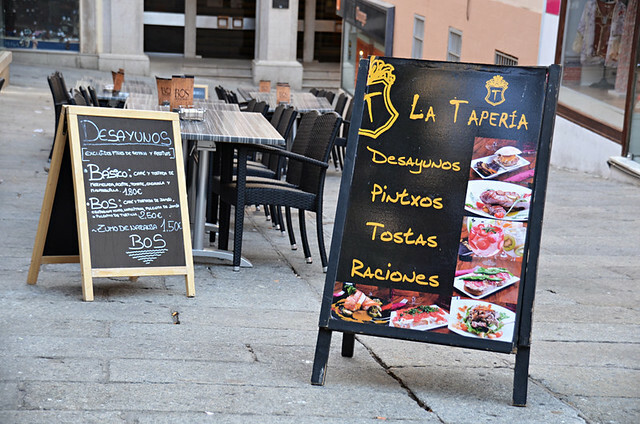 Cáceres is not the easiest place to choose somewhere for lunch. There is an overdose of inviting taperías with drool-inducing menus. Plaza Mayor, at the heart of the old town, is the sort of square which can bowl you over with a charm tsunami. 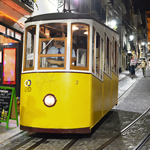 Historically attractive, it has UNESCO World Heritage Site stamped all over it… plus there are plenty of restaurants. And there are also lots of touts standing outside of them. They might serve excellent food, but one too many invite to look at a menu had us retreating to the more laid back area around Plaza San Juan where the tapas degustación menu at BOS (Calle Maestro Sánchez Garrido 3) lured us in. Despite mixed reviews online, and a forgetful waitress, we relished a tapas bonanza which included strips of ibérico with caramelised onions, a mini burger with quail egg, spicy steak and gratinated salt cod salad served with a couple of cool and crispy local whites (tapas averaging €4.20). The Cáceres visit was immediately prior to a birthday jaunt to Albufeira, the birthday part involving three of the women in my life (wife, mother, and sister). 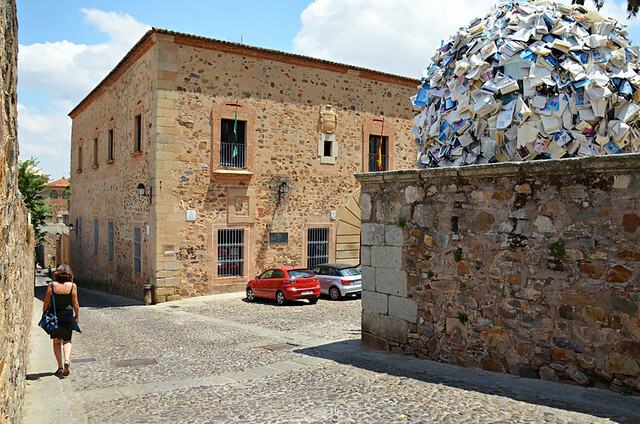 Cáceres proved to be an exceptionally good hunting ground. The streets emanating from the old town playing host to indie fashion shops, displaying clothes with more individuality than the usual High Street suspects, and jewellers selling unique and arty Extremadura pieces at great value prices. Birthday shopping was completed in record time. 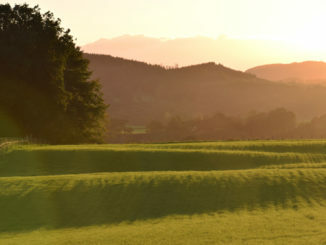 Despite the wealth of historic sites to be explored there was more serious business to be taken care of first. I’d been having bad hair ground hog days for a month due to a lack of hairdressers in rural Portugal. Esther’s Unisex seemed promising. But 40 mins after my appointment and still no sign of being dealt with, I aborted and left Esther to her rows of women with aluminium foil strips twisted into their hair and a man who clearly aspired to be a ventriloquist’s dummy (all his facial hair had been dyed jet black). Thankfully Andy had come across an alternative, an old school but modern barber in the Canovas shopping centre. My simple ‘tres con la maquina aqui, aqui y aqui’ haircut was completed in almost the time it took me to give the instructions, and for a reasonable €10. We booked El 13 de San Antón (the name is also the address; open 9am to 5pm and 8pm to 1am Tuesday to Saturday, 9am to 5pm Sunday, closed Monday) because its degustación (taster) menu hooked us. It consisted of exactly the sort of contemporary take on traditional food we were looking for. Despite the reservation being for 9pm we were still amongst the first diners to arrive. By the time we left it was packed and buzzing with the sort of atmosphere which makes Spanish dining so enjoyable. None of that eating in library type nonsense. 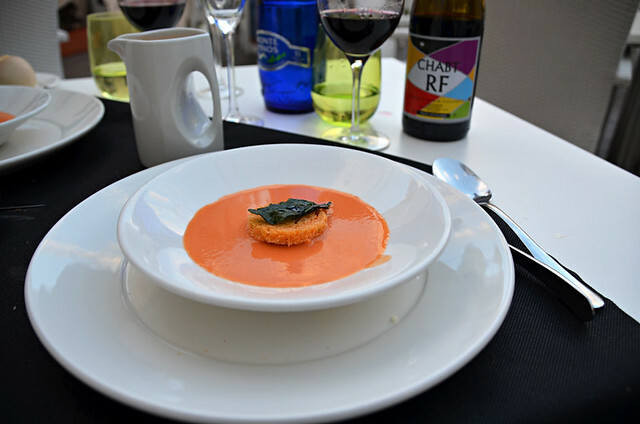 The taster menu consisted of a savoury sobrasada amouse-bouche; carpaccio of presa Ibérica with cured sheep cheese and orange marmalade; cold roasted tomato soup on a basil iceberg; ham and boletus risotto; ibérico steak, and torrija with English cream, coffee ice cream and Licor de Bellota. 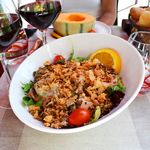 Not only did the meal back up the opinion of the person who’d commented on the Guardian article – the soup and risotto being stand out dishes – it was exceptional value at €29.90 pp, a price which included a bottle of wine, water and coffee. Post dinner activity consisted of seeing off another bottle of local vino whilst wallowing in the warm and cosy charm of Plaza San Juan. With breakfast in the hotel being ‘I’d have to obscenely pig out to make this good value’ prices, we simply popped outside to the plaza where most restaurants and cafés offered desayuno, opting for La Taperia (Sanchez Garrido 1; open 9pm to 1am, closed Monday) because it was the only one which actually looked open (breakfast clearly starts late in Cáceres). A brace of coffees each, chunky tortilla, toast and jam, and some complimentary slices of home made cake came in at a fraction of the price we’d have paid in the hotel. Aside from eating, drinking and shopping, we did explore the old town in an anarchic ‘ooh, what’s up there sort of way’. Climbing from Plaza Mayor we followed cobbled alleys and narrow passageways, passing the Provincial Museum with its Muslim cistern, the Moorish Torre de Bujaco and the 16th century Carvajal Palace as well as a huge ball made from books, artistic graffiti and an old sign which seemed to consist of a bear in chains. 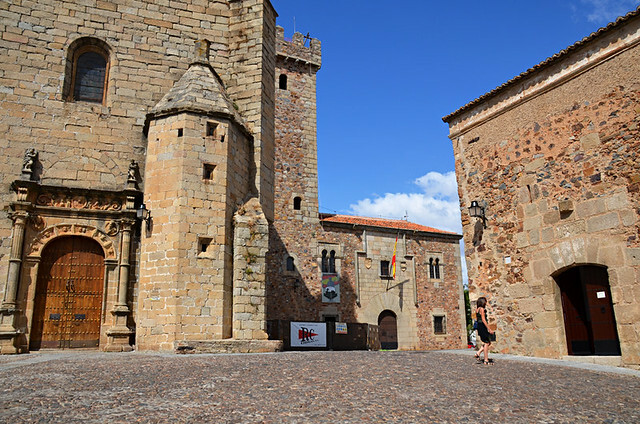 In Plaza Santa Maria Andy remarked that Cáceres would be a great setting for Game of Thrones. An hour or so later a jeweller, whilst filling us full of information about the surrounding area, mentioned the city would be in the latest series of GOT. It quickly became evident there’s a depth and richness to Cáceres which require a greater investment of time. 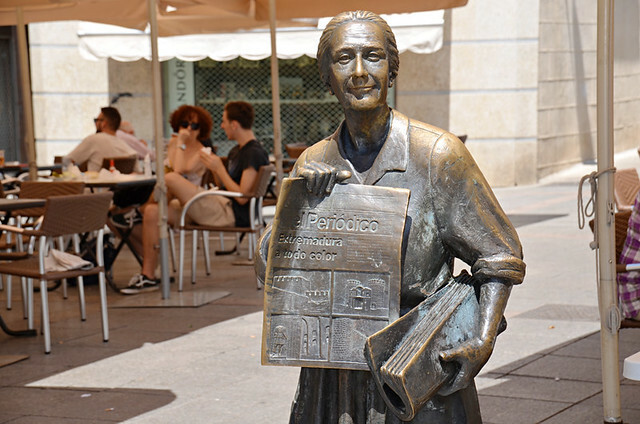 24 hours in Cáceres was a taster visit where we learned a few things about the town. It’s beautiful and interesting, it’s friendly and the shopping is very good (there’s one shop where Andy wants to buy all the stock so we’re not mentioning it). One thing more than any other will draw us back before too long, the restaurant scene. 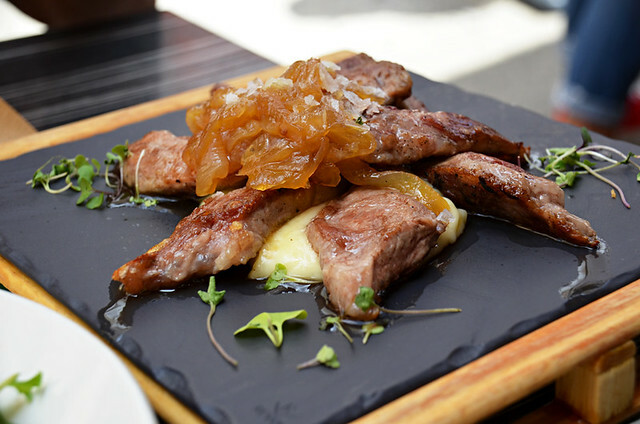 Gastronomically, it’s simply our sort of place.